Perhaps the Best Beef Dish in the World. The Minangkabau are a people group from the island of Sumatra in Indonesia. And man, do they know beef! They make, perhaps, the best beef dish in the world: beef rendang. Here in Penang, near my house, there’s a small lunch stand called Nasi Padang. Nasi means rice. Padang is a town in West Sumatra. Okay, you know where I’m going with this? This is real Minangkabau beef rendang, and it is absolutely out of this world. It’s expensive. Each piece is RM3 which is about 75 US cents. Okay, so I lied. It’s actually expensive for here, but it would be dirt cheap in a mall food court in America. It would also be the best tasting dish in any food court in North America. First, let me explain that dish above. Top right is a tasty combination of Indian-spiced cabbage and bean sprouts. They’re terrific. Very top left is a wonderful egg omelet and botton left is the sauce to a great sweet-spicy chicken which is covering the rice. All of it is fantastic, but the true hero of this plate is center-bottom. That’s the three pieces of beef smothered in the most flavourful sauce you will ever taste. For real beef rendang, they start with a plethora of spices and coconut and grind it all with a pestal and mortar. Liquid, oil, and other delightful items are added to the beef, and it’s slow-cooked for hours until all the liquid evaporates, and you are left with an extremely intense coconut and lemongrass flavor. I can’t properly describe it, because it simply explodes in your mouth. There’s nothing like it, and it coats the fall-to-pieces slow-cooked beef to create a perfect combination of bite and flavor. Oh my goodness! It’s tremendous. There are many types of beef rendang. All of them good. 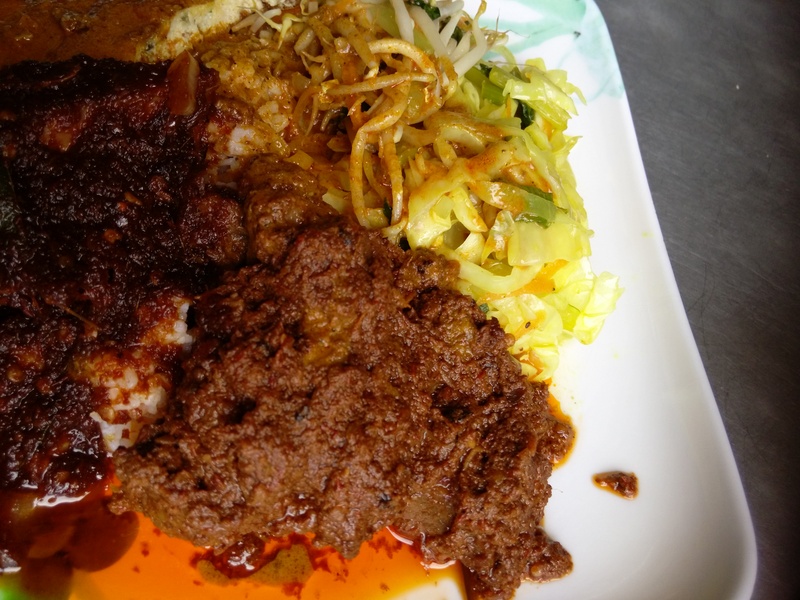 There are many Malay-Indian restaurants and shops in Penang which make beef rendang. Most of them are liquidy and seems more like a curry. They still taste good, don’t get me wrong. But the original, the Minangkabau beef rendang is the standard. Maybe the world standard for a beef dish. I love it so much. If you ever get a chance, do not miss it. This entry was posted in Life, Penang and tagged Asian food, best beef dish in world, cooking beef, Indonesian cuisine, Penang by sassevn. Bookmark the permalink.